The Prudential Committee, also known as PruCom, is the governing board of the church. It is composed of six officers — president, president-elect, past president, clerk, treasurer, assistant treasurer — and six other voting members of the church. 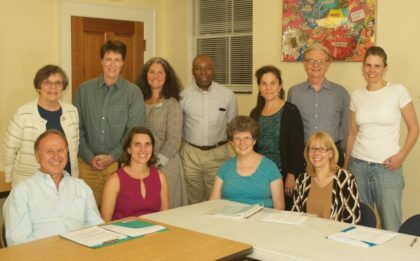 Four committee members serve as liaisons to the four ministries of the church: Spiritual Development, Community Life and Heritage, Stewardship, and Social Justice. They serve as a liaison to the groups, committees, and leaders under each ministry umbrella and provide support. The PruCom sets policy and long-term goals, establishes committees, hires professional staff other than the minister, manages the operating budget in accordance with the by-laws, and performs other necessary duties. Members are elected to three-year terms. Officers are elected annually to one-year terms. Clerk, treasurer, and assistant treasurer are renewable. The six-member Nominating Committee is responsible for identifying and developing church leadership. Members are elected for two-year terms. In addition to recruiting for elected positions, they help identify committee chairs. Nominating Committee members have an understanding of the structure and work of the organization, leadership needs, and the special qualifications needed for elected and appointed positions.